Warriors FC showed flashes of the kind of form that made them early season title-contenders, in a 2-0 win over Geylang International at the Jalan Besar Stadium last night. 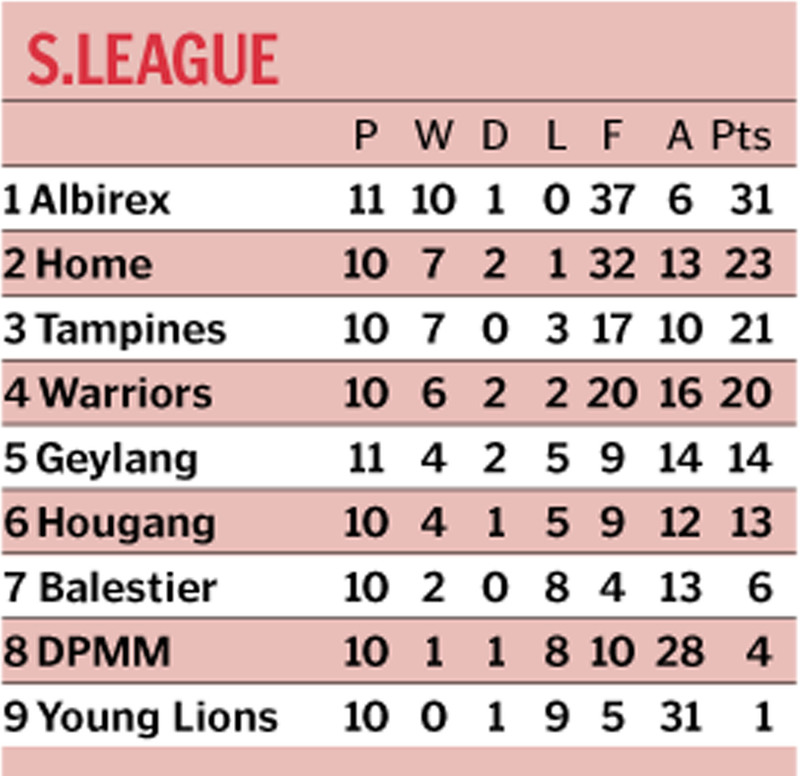 As recently as six weeks ago, Warriors were level on points with league leaders and reigning champions Albirex Niigata, second only on goal difference. But, after two defeats and a draw in their last four matches - their only win was a less-than -convincing 1-0 victory against Balestier Khalsa - they slipped down the table to fourth. They were also knocked out of the RHB Singapore Cup after a shock 4-1 defeat by Cambodian side Boeung Ket. Last night, the Warriors returned to winning ways, thanks to a double by national skipper Shahril Ishak. Said Warriors coach Razif Onn: "We played good football in the first half and did not give them space to play. "We really pressed them, and we haven't seen that in recent matches." Despite missing winger Jordan Webb (hamstring injury) and new Romanian striker Andrei Ciolacu (work pass), the Warriors started brightly, and Shahril was denied an early goal after just four minutes by a crucial tackle by Faritz Hameed. Geylang had a golden opportunity to score a minute later, but winger Gabriel Quak sent his header into the side netting from close range. On 16 minutes, Shahril opened the scoring when he stole in at the near post to nod Shaiful Esah's corner home. Four minutes later, Shahril was perfectly placed again to head home from close range to cap off a slick counter-attack. Geylang, however, still had chances to get something from the game in the second half. In the 63rd minute, Costa Rican striker Victor Coto was played through on goal by Faritz but saw his one-on-one opportunity saved by Warriors goalkeeper Hyrulnizam Juma'at. Seven minutes before the final whistle, Argentine midfielder Ricardo Sendra timed his run to perfection to meet Faritz's pin-point cross, only to blast over from barely 10 metres out. Said Geylang coach Hasrin Jailani: "In the first half, we were second-best, simple as that. "Second-best to tackles, the second ball... (and) Warriors took their chances and scored two goals. "We came out in the second half and had our chances, but at the end of day, it wasn't enough."